Are you a customer of Indian Bank? Do you use the Debit/ATM Card? Do you keep the card safe? The card may get stolen, or you may lose or misplace it. If anyone finds the ATM Card, there are possibilities of misusing it. The person may withdraw the balance amount in your account. You must immediately block/hotlist the lost card to prevent misuse. Indian Bank offers different methods to block a lost ATM Card. You can select any one of the methods and block the card immediately. Let's learn about different methods of blocking the Indian Bank ATM Card. 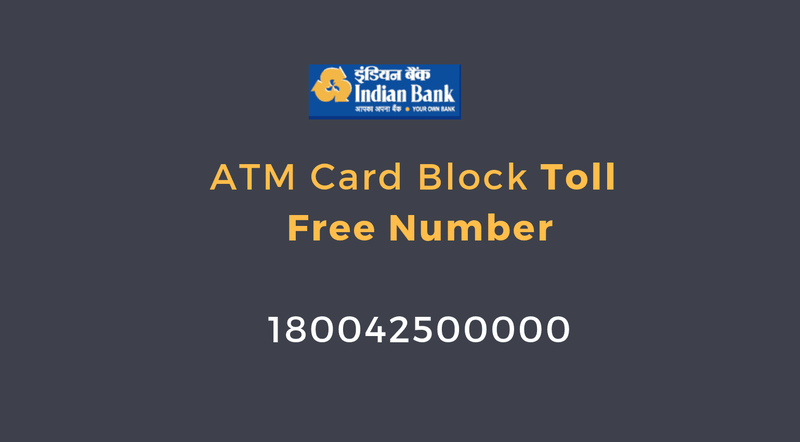 You can call the 24X7 toll-free helpline number and request to block your ATM card. Dial National toll free number 180042500000 from your registered mobile number. Follow the IVR instructions to connect with the customer care executive. Register a complaint to block the ATM Card. The executive will make queries for verification purpose. You need to provide authentic information to the executive. After confirmation, the ATM card will get blocked, and you will receive a successful message on your registered mobile number with a reference number. Apart from dialling the toll-free number, you can dial paid numbers and request to block the card. Dial 044-25279884, 044-25279897, 044-25279898 or 044-25279899 from your registered mobile number. Follow the IVR instructions and connect with the customer care executive. The entire process of requesting to block the ATM Card is the same. You can send a request via email to block the ATM Card. Mention the relevant details about the card, account and account holder and send the email to atmhotlist@indianbank.co.in or hoatmmonitoring@indianbank.co.in. You will receive a confirmation email from the bank after the ATM card gets blocked. If you are not comfortable with the methods mentioned above of blocking the ATM card, you can visit the home branch and request to block the card. Meet the accounts executive and state your requirement of blocking the ATM card. Make sure mention the specific reason to block the card. You may require producing the relevant documents if required, so, make sure to carry the related documents like the passbook, identity proof and if possible the letter received with the ATM card. The executive will block the lost card after verifying the details and will notify you. Indian Bank offers different methods to block the ATM Card instantly. Don't delay to select either of the options to block the debit card. The lost card may get misused, and the money from your account will get withdrawn! Take the decision fast and block the card.